International students will have more opportunities for internships, to take part-time jobs and even to start their own businesses in certain regions of Beijing, under a series of new policies released on Tuesday. The Ministry of Public Security has announced starting on March 1, foreign students can be given short-term internships in Zhongguancun, a science and technology area in Beijing's Haidian district, while international students studying at Beijing universities can take part-time jobs or become involved in entrepreneurship in the area, the Ministry of Public Security said on its website. Li Yong, director of the student affairs department at the School of International Education at the University of International Business and Economics in Beijing, said teachers at universities have been concerned about their international students' opportunities for internships, jobs and entrepreneurship since late 2013. "Now with the opening of Zhongguancun to international students, we don't have to worry about the issue that much," said Li, who serves more than 3,000 international students at UIBE. "It will provide more possibilities and opportunities for international students who want to find jobs or start businesses in China," he said. A survey of more than 300 South Korean students studying in China found that 90 percent wanted to stay in China - by landing a job or starting a business in the country after graduation. "But there were many difficulties for them," said Kwon, adding that this was why the center was set up on the campus of UIBE in September with the support of the South Korean Ministry of Future Creation and Science. Through workshops and training sessions, the center taught the essentials for Korean people who want to start a business in China — commercial laws, how to cooperate, how to apply for business licenses in China and other matters. Han Kang-il, chief director of the center, said it had already cooperated with Dongsheng Science Park of Zhongguancun Area. The park has been acting as an incubator for members' entrepreneurial ideas, Han said. 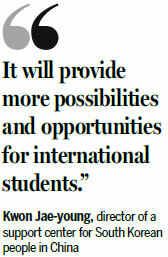 "We may have more partners and incubators after the whole area is open to international students," Han said.